Chiwetel Ejiofor, Actor And Director, On 'The Boy Who Harnessed The Wind' The English actor performed in, directed and wrote the screenplay for The Boy Who Harnessed The Wind. It's based on a memoir by William Kamkwamba, whose ingenuity helped save his village from famine. 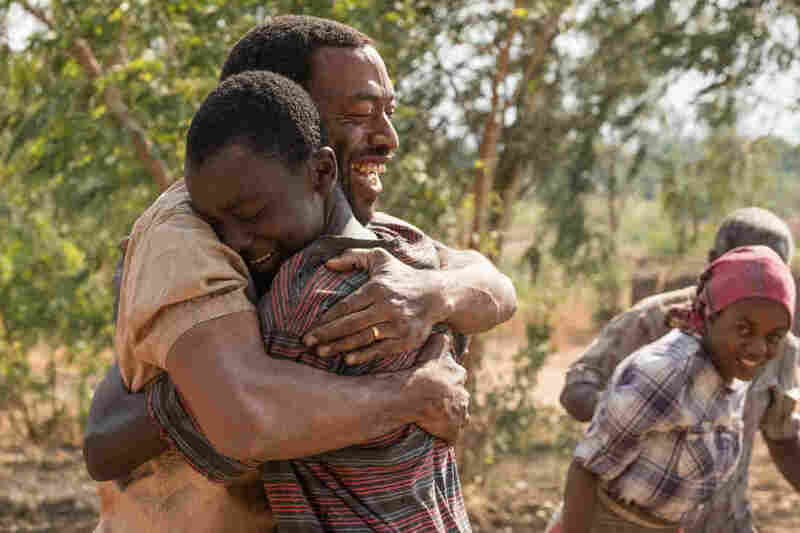 In The Boy Who Harnessed the Wind, Chiwetel Ejiofor (left) plays Trywell, the father of titular teenager William Kamkwamba (played by Maxwell Simba). Ejiofor also directed the movie and wrote the screenplay. "I started off thinking that I would adapt it," Ejiofor says in an interview. "That was my first, sort of, plan. And then in the process of doing that, it sort of became clear, especially when I started to travel to Malawi to meet William Kamkwamba, to meet his family ... that's when it sort of became clear that I was making very directorial choices in the visual nature of it, and what I kind of wanted the film to feel like and to be expressed as." Now Ejiofor is the director, screenwriter and a star of the new Netflix film also called The Boy Who Harnessed the Wind. Ejiofor plays Kamkwamba's father, Trywell. He took me down to a place that's called the ADMARC grain reserve. And it's actually featured in the film, and it's where he went — you know, at [age] 13 at that time, during this famine, during this food crisis — and he went down there to try and get a bag of grain for his family. And the place sort of broke up into kind of chaos, as there was not enough grain that had been delivered to this place in order to sort of feed the amount of people, the amount of need that was there. I was aware then, and through this process, that it's – and as he describes it, it's a very kind of mixed emotion that he has when he watches the film, when he engages with the film. Because of course, he celebrates all the optimism, and the hope, and how things turned out for him and his community in many ways. But also, it does take him back to this very, very challenging part of his life. Well, somebody did say once, I think it was Admiral [Horatio] Nelson, that the boldest move is the safest. So somehow, I feel like just kind of totally going for it ... one decision sort of led into the next, sort of naturally, you know. So making that decision to try and create an authentic experience then opened up these other avenues where I then, you know, felt: "Well, in that case, I guess this needs to happen, and in that case, that needs to happen," and then it sort of snowballs in that way. They're called the Gule Wamkulu, and they are the kind of spiritual center of Malawian cultural life. They're a secret society of dancers, and they turn up at different cultural events, which can be funerals, which can be weddings, a chief's inauguration, these sorts of things. You know, when I went to Malawi, I was really trying to find the Gule, and it became a sort of thing for me. And there were very difficult to find, to pin down — I mean, they're a secret society after all. And so that became a kind of frustrating process for me, because I did want them to be in the film, but I didn't want to put people in costume, you know, sort of as dancers pretending to be the Gule Wamkulu kind of thing. I wanted the actual Gule to be in the film. And so that took a while. And it was only kind of late in our pre-production period that we were sort of finally invited to a village to see the Gule perform. And it was one of the most magical afternoons of my life. And so, you know, the Gule agreed to be in the film. I think it's about perspective, you know — I think it always has been. I think that's the charge and the challenge of diversity in film, is that we want to kind of engage with different voices, different perspective, different viewpoints, different ways of seeing the world. And I think that that is what the reward of all of that sort of idea and question of diversity is — is that we understand the world more fully because we understand the voices and the makeup of the people in it. Kat Lonsdorf and Mallory Yu produced and edited this interview for broadcast. Patrick Jarenwattananon adapted it for the Web.